Urgent dental care is often needed when someone experiences a dental emergency. Urgent dental care facilities deal with emergencies of the gums, mouth, and teeth on a walk-in basis like traditional urgent medical care clinics. Dental emergencies are time sensitive so it’s best to deal with them as soon as possible. Try to quickly find a dentist to treat your condition before it becomes something more serious. Unfortunately, sometimes dental emergencies happen after most dental clinics are closed. That’s where urgent dental care can maybe help. Urgent dental care clinics are not as common as traditional dental offices and aren’t advertised as much, but most places that offer urgent dental care have after hour and weekend hour availability. You may not find an urgent care dentist with a ton of availability, but they are out there. Our night dentist directory includes plenty of walk-in dentist offices and will help you to find the nearest one to your location. The specialists employed to help you find dentists are trained to locate the nearest walk-in dentist to your neighborhood, don’t worry you’ll be taken care of. Google is a great place to start when searching for an urgent care dentist but it may not always provide you with the most accurate results. Sometimes, they may recommend a clinic that doesn’t offer urgent care dental service just because it’s closer to you. There’s also no way to verify the quality of its recommendations. 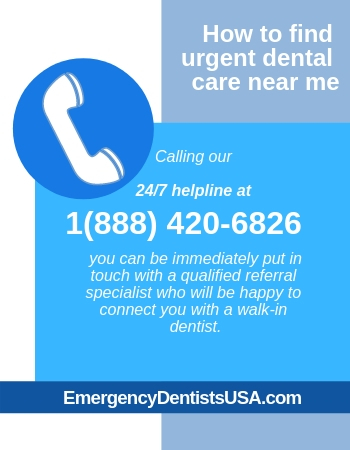 At Emergency Dentists USA, we can help because we provide free services to help you find the best urgent dental care office near you. When you call our 24/7 helpline at 1(888)420-6826, you will be immediately put in touch with a qualified referral specialist who will be happy to connect you with urgent dental care. They will do their best to find the dentist closest to you that best fits your needs. Our referral specialists are well connected with the walk-in dental clinic as well as all other types of night dentists. Should you be in the need for a dental urgent care appointment directly after work today, simply call the referral hotline and spend a moment talking to the operator. On top of this, we’ve researched the best dentists across the country that can be found in an online listing. They have been vetted by a team of industry experts with more than four decades of experience between them. 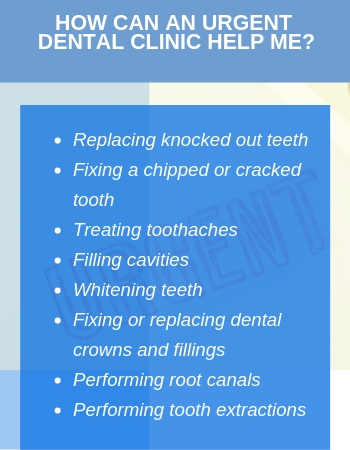 This results in getting connected to urgent dental care clinics that offer services you can trust. How can an urgent dental clinic help me? An urgent care dentist is likely to offer the same services as traditional dental offices. However, urgent care is meant for serious situations so dentists may prioritize emergency dental services over routine x-rays, cleanings, and exams. Preparing for an urgent care dentist there are some things you should do to prepare before your appointment. Since you’re going to be heading to the dental office with no scheduled appointment, there may be waiting times as other patients are likely to be there. However, one way to possibly reduce your waiting time at an urgent dental care clinic is by bringing any recent dental records such as insurance information, x-ray records, or previous receipts. If possible, call the clinic as you’re heading to their office to make sure they can accept your form of payment. If you have any anxiety about going to the dentist, make sure you let the dental office know as soon as you arrive. They will want to do what they can to make sure you are comfortable throughout your entire visit. Are there urgent care dentists? Does urgent dental care cost more? If you’re in need of emergency dental care our referral service can quickly help you find an urgent dental care clinic to receive care fast. Call our hotline anytime as we are available 24/7. Can I receive urgent dental care without insurance? If you don’t have insurance you can still be seen by an urgent care dentist. Just know that dental costs overall are more expensive without insurance. If you’re worried about costs, talk to the staff members at the urgent dental care clinic to see if they offer any payments plans.